“I haven’t seen toyi-toyi since the demonstrations,” a talkative South African who is joined us today said as we walked past a group of Zimbabwe musicians and dancers making music and singing in full costume in the parking lot of the national park. Of course I ask – What is toyi-toyi. And the answer is surprising to me. It’s a dance that came from Zimbabwe but was coopted by South Africans during the demonstrations against Apartheid to intimidate the troops with all the foot stomping and chanting. And this is how Mom and I started our visit to one of the seven natural wonders of the world … Victoria Falls. 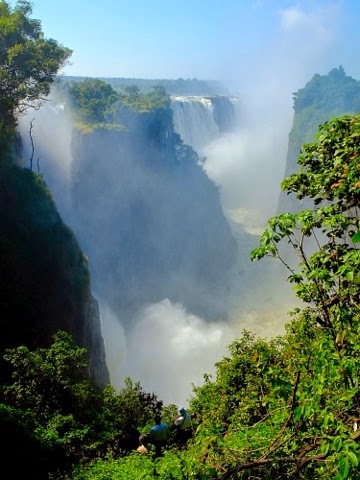 Or, as the locals call it, Mosi-oa-Tunya, which means the smoke that thunders – and this is a much better name for it. I was hesitant to come here at all. I’ve travelled enough to know that places like this that attract mobs of tourists are inevitably painfully touristy. There is too much money coming in from international visitors to a country that desperately needs it, and where the people desperately need it – to expect to pass through easily and peacefully. My Mom and I came anyway, calling it the equivalent of paying a bucket list tourist tax … we get to see the largest falls in the world but the touristy hounding and herding is the price to be paid. Not that people were unpleasant – everyone was exceedingly polite. Everyone introduced themselves and gave us their name. Even the people trying to sell us the worthless Zimbabwean former currency with notes worth over Five Billion with the enticement “You can be a billionaire!” were polite. The old currency was abandoned by Zimbabwe in 2008 when they adopted the US dollar. The man who asked whether he could meet us outside the hotel to take any clothes we didn’t need to his mother … he was also incredibly polite. The shopkeepers who asked us to buy anything because business was so slow … They were polite. And the musicians and dancers who worked so hard to get us to buy a CD … perhaps not realizing that there was something that felt so uncomfortable … and wrong … about displaying their culture in such a solicitous way … they were all polite. We were always safe. And interestingly, they always go after me, but leave Mom alone – she is allowed to peacefully trail behind me while I am fending off two or three folks wanting to sell me something. There is some unwritten rule that vendors follow when approaching travelers – and this seems to be followed globally. For whatever reason, when I travel with my Mom the rule is to approach the younger woman. But when I’ve traveled with a man, it’s always the man who is fending off solicitations and I’m generally left in peace. When i travel alone I’m often not bothered at all. Perhaps because they approach the person who is perceived to have the income. Perhaps because they know that there is an instinct to want to protect who you are with if they are perceived to be more vulnerable, so you are more likely to give out money or buy something to make someone go away. But regardless we were a lifeline … tourism here is a lifeline. Literally. And Victoria Falls has created every opportunity to help people leave their money behind. Seeing the Falls takes about 2 hours and a hefty park fee. After you can take your pick from activities – helicopter rides, boat trips, walking with lions, riding elephants, bungee jumping from the bridge, ultralight rides, wildlife trips to private nature preserves, village tours … A huge selection of things to do to keep people busy and spending money. Most tourists are booked into packages and housed in lavish — and expensive hotels with all inclusive meals just outside of town. I’m not sure how much of the money spent there makes it into the local community. Mom and I are booked at a campground with basic cabins in the center of town where we can walk to the grocery store and be a bit more independent. At least here we know our money is going into local hands. The falls themselves were huge and magnificent as billed. The Zambezi River is currently at 80% of capacity and that means we were soaked before we were done with our walk. And viewpoints were so wet and obscured by mist you couldn’t see – and definitely couldn’t pull out the camera. And that was OK. It was warm and sunny and lovely. And Mom was very happy – this is something she has always wanted to do. So as we walked back through the parking lot and past the dancers looking at us hopefully as they danced the toyi-toyi, I was glad that we came. Because paying the tourist tax here was worth it … but not because of the waterfall. But because even those the people here need our money and our visit. They are polite and kind and helpful and good people. They are proud. They have dignity. They want to share their music and dance and culture … and their natural wonder. And I suspect they can’t imagine how jaded westerners like me might find it awkward. As I write this a group of 12 or so costumed young men just showed up at the restaurant singing and dancing. They sound great. And tonight, I hear them differently. They want you as a visitor to see the beauty of the country they are proud of and want to share. And this time I bought their CD. And I enjoyed their music. And I thanked them for coming. And I expect this is because I spent my day paying the tourist tax … and by the end of the day I understood what I was getting back went well beyond seeing a waterfall.